It seems like, lately, a lot of my patients come in with the same problem: they have a hard time getting rid of their possessions. At first, it starts harmlessly: they keep old childhood knick-knacks or arts & crafts their children made, and eventually it piles up until they have a stack of old papers, and objects that they never use. They always come to me knowing there might be a problem, but afraid of what it might entail to fix it. And I always have to tell them the truth: getting attached to your possessions is easy, but letting go is very difficult. It’s so challenging that hoarding is actually classified as a mental illness, according to the Diagnostic and Statistical Manual of Mental Disorders. That’s because, just like any other illness, it comes with numerous health consequences, to the six million Americans that have hoarding problems. How can you know if you’re a hoarder or if you’re just a bit disorganized? According to the International OCD Foundation, hoarders share three characteristics: they collect too many items; they have a really hard time letting go or getting rid of these items; and they aren’t skilled in organizational management. Now, before you say you can “quit whenever you want to,” take a good, hard look in the mirror and ask yourself if you would really be okay with getting rid of all the things you don’t use. And if the answer is no, then I’m here to help. Hoarding usually starts in childhood, but the problem gets worse as you age, as the habit becomes more and more engrained in you. Men are more likely to hoard than women, but women will be more likely to hide their hoarding. Some studies show that as many as one in 20 adults have hoarding problems. Hoarding means a lot more than just buying and keeping things you don’t need—it’s a psychological illness that can really affect your health. 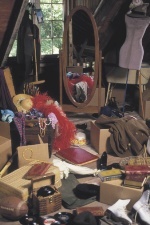 For starters, hoarders often feel a connection with their possessions, and become emotionally dependent on these things in their lives. In fact, a study published in the Journal of Consumer Research found that a stressful life event may draw you to hoarding—and then it becomes difficult to stop, as you get attached to your possessions and rely on them to fill the emotional void in your life. Then, it just gets harder and harder to reach out to people instead of things. If that doesn’t worry you, then consider this: there have been numerous reports of hoarders causing enormous physical damage to themselves and their homes, because of their hoarding problem—including a British Columbia man who had to be rescued after getting stuck under his possessions and a few cases in Toronto where fires were started because of hoarding. Because it’s a serious illness, you must watch out for the symptoms we mentioned above, and turn to your family and friends for help. If you’ve struggled with this problem for years, talk to a mental health expert—a psychologist or an OCD specialist—about how you can fix this. They’ll help you work through the reasons for your hoarding. But to truly get help, you have to really introspect and learn why you’re hoarding to begin with, and then recognize those situations to avoid them in the future. “Causes of Hoarding,” International OCD Foundation. 2010; http://www.ocfoundation.org/hoarding/causes.aspx, last accessed March 11, 2013. Ridgway, N., “Measure of Compulsive Buying,” Journal of Consumer Research. December 4, 2008; 35(4): 622-625.